New Haven, CT August 24–As expected, Genie Bouchard had another brief tournament appearance today. Fresh off her first win since Eastbourne in Cincinnati last week, everyone wanted to know if it would be Old Genie or New Genie as the US Open approaches. 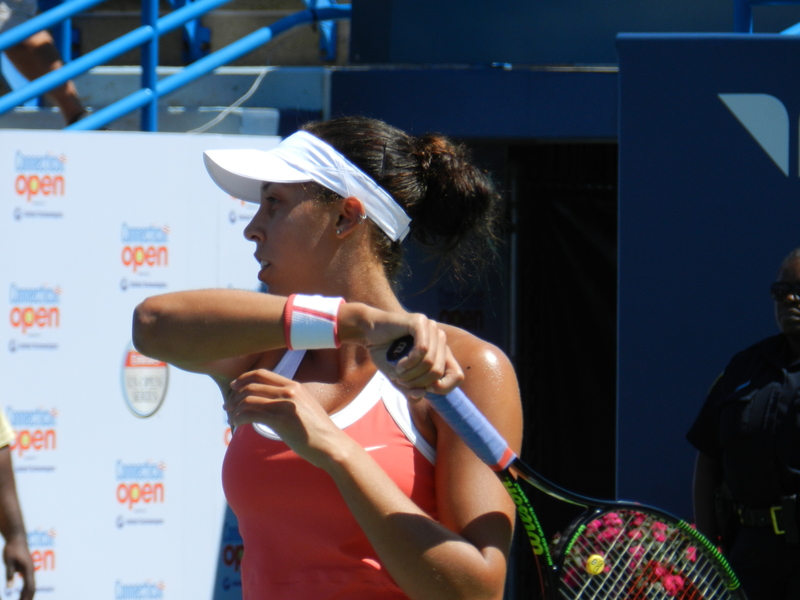 Roberta Vinci was happy to see the listless New Genie on Stadium Court at the Connecticut Open today as she dismantled the Canadian 1 & 0. No one requested Bouchard in press, and no one requested Vinci. Madison Keys triumphed in a match with Elina Svitolina, as Svitolina retired with a right thight injury in the second set. Keys won a tight first set in a tiebreak and was clearly in control before 4-2 before Svita threw in the towel. Keys was the polished darling she’s become in press after the match and refused to say anything about her significant chances to dethrone defending Connecticut Open champ Kvitova in the next round. But the biggest news of the day involved La Republique. The French Invasion is upon us, tennis fans. French #3 KiKi Mladenovic surprised herself and #16 Sara Errani in a three set win. Errani was clearly shocked as she walked off court and talked to herself all the way to the locker room. Mladenovic, who dropped the second set and was down a break in the third, broke back and simply stole it from Errani. In the interview above, Mladenovic agreed that her maturity as a player allowed her to win that match. She’s on Stadium second tomorrow around 2:00 p.m. for a date with Dominika Cibulkova. An hour later, French #2 Kiki Mladenovic pummeled world #14 Timea Bacsinszky 6-3, 6-1 in 54 minutes. Garcia played well and let Bacsinszky kill herself with eight double faults. Garcia plays 2014 New Haven finalist Magda Rybarikova right after Mladenovic on Stadium tomorrow. Then it was time for La Grand Dame Avec Un Petit Nez to take her turn on court. That’s French #1 Alize Cornet to you, who at 25 is the oldest French player in the top three with Garcia and Mladenovic. The top three, who are all in the top forty, are also the only French players in the top 100. The Grande Dame drew the Petulant Putintseva in the first round. The Petulant Putintseva dropped only four games in three qualifying wins over the weekend, and she came in as a major threat to any opponent. And Petulance delivered, almost. Putintseva raced out to a 6-2 first set before compounding mistakes and self-demolishing the second set at bagel. The Muscovite dug down in the third, but Cornet had already won the mental game–and the match 2-6, 6-0, 6-2. For Petulance, an impressive run on the weekend. She is the master of qualies and I think she’s subtly calming down. I’m bullish on her for the US Open. What a day. Grand Dame Cornet takes on Agnieszka Radwanska in the next round. Of course it’s only one day, but it’s enough to want to go long on France in Flushing.